With the start of the Olympics right around the corner, you know that Steve Yzerman, Mike Babcock and the rest of the Team Canada coaching staff will be keeping a close eye on their goaltending situation. Perhaps the one goaltender they’ll be watching closest is Montreal Canadiens netminder Carey Price. 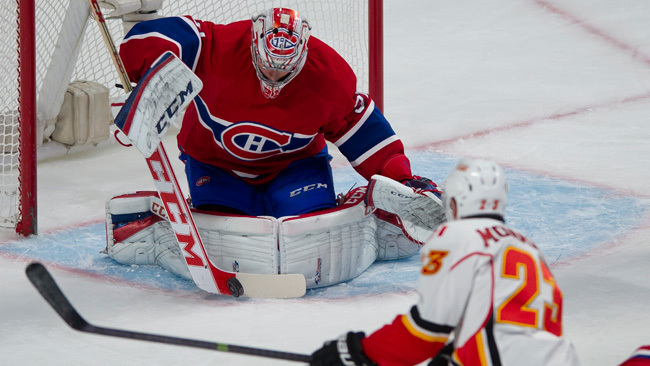 And if they were watching him during last night’s game against the Calgary Flames, they’ll certainly be impressed with what they saw, as Price stopped all 27 shots he faced during a 2-0 shutout victory. The shutout was Price’s fourth of the season and in addition to making a good impression before heading to Sochi, his performance also earns him “The Stat Line of the Night” for Tuesday, February 4, 2014.